It’s that time of year to shake off the cabin fever from winter… It’s time to gather again to dance under the sun & stars …. 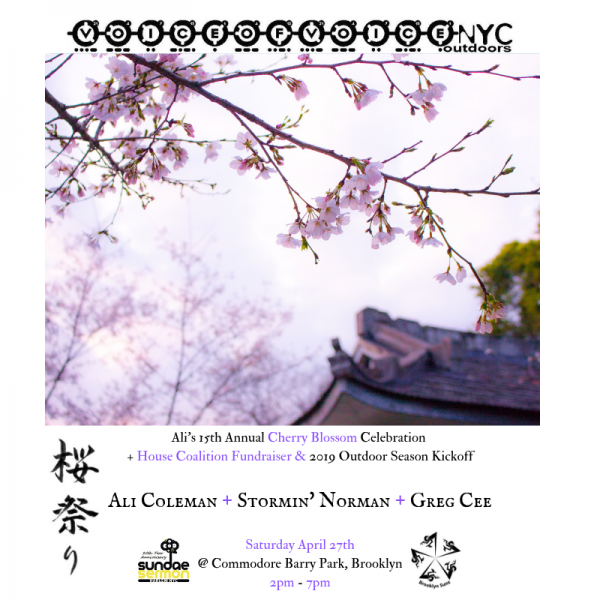 Voice of voice NYC Outdoors in association with Brooklyn Sunz, Sundae Sermon, House Coalition and Family Dance Brooklyn invites you to “Ali’s 15th Annual Cherry Blossom Celebration (Sakura-Matsuri) & House Coalition Fundraiser + the Un-Official Official Kick-off of the 2019 NYC Outdoor Dance Season! Visit www.danceparade.org, select “participate in the parade” and register as a participant to dance with House Coalition in this year’s parade. @Sundae Sermon’s mission is to support the spirit and strengthen the Harlem community by providing a platform to promote environmental, educational and recreational family friendly activities in a healthy, casual communal environment. It seeks to foster and connect fundraising and friendraising efforts of compatible charities and foundations through Musical Performances and Film Screenings. Founder of Sundae Sermon, DJ Stormin’ Norman originally hails from East London, UK and is now a resident of Harlem, USA. In the 90’s, he was part of a groundbreaking DJ collective who brought the Thunderstorm Mix on WBLS 107.5FM NYC, introducing live mixing to daytime radio previously reserved for weekend nights broadcasted from night-clubs, setting a new precedent in national radio.